Allow bread and drinks to decompose over time under different conditions. Discover the living things responsible for decomposition and how different conditions affect their growth. Note this activity several days and up to two weeks. 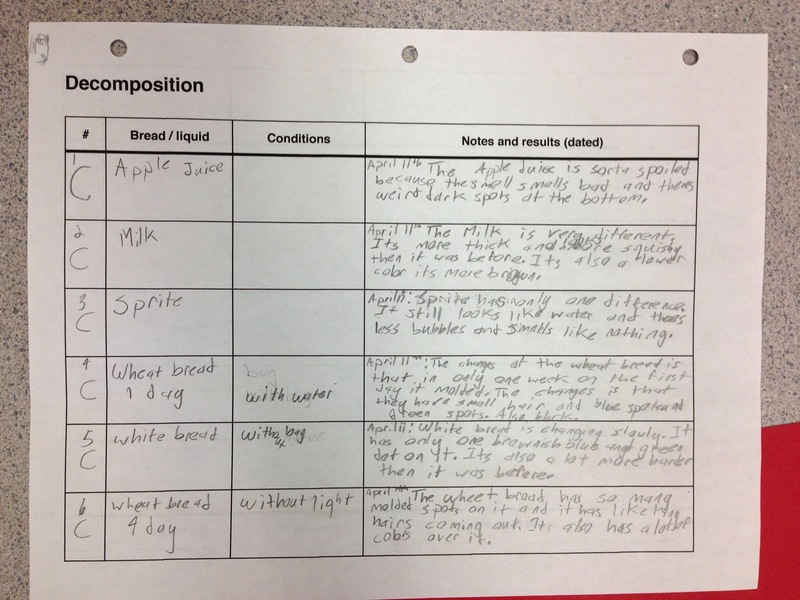 Students can choose what conditions they would like to test for how they affect the decomposition of bread. They should set up a series of samples, and record the treatments on a worksheet. Make sure that students understand that they should only change one variable at a time to conclude how a variable affects decomposition. If several groups are setting up the experiment, groups can pool their data as long as they are fairly consistent in how they handle the samples while setting up the experiments. They can also choose one of the liquids and change another variable e.g. temperature, light level. Make sure the drink samples have lids, or the liquid will evaporate away during the experiment. 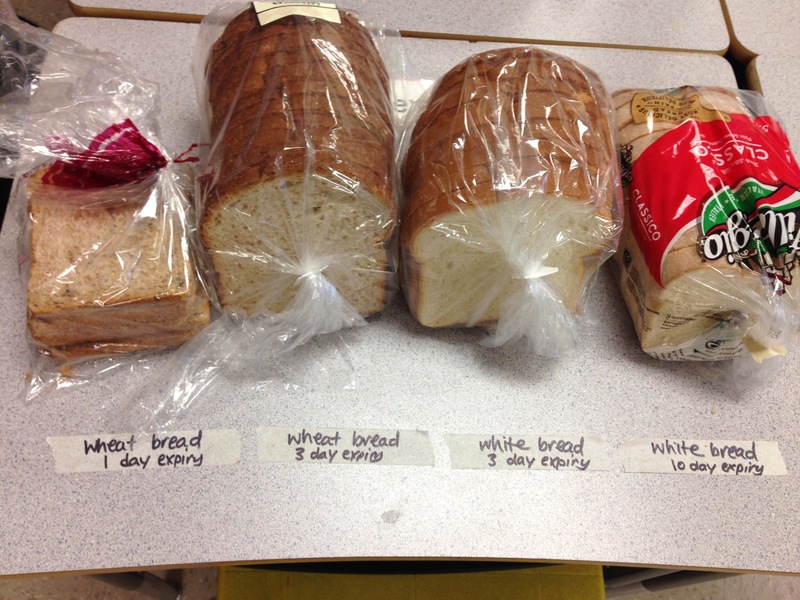 Leave the bread and drinks undisturbed for a week, then ask students to document any changes on the worksheet. They should notice changes in texture, colour and smell. For safe smelling of a sample that might have unpleasant odours, teach students how to waft air from above a sample towards their nose (rather than sniffing the sample directly). If they find mould, they can record the number and colour of the colonies. They should leave the samples in their baggie/keep the petri dish lid on, to avoid possibly unsafe ingestion of mould spores. After a week for the drinks, the milk will be clumped and stinky (discard it after the lesson), the apple juice may have a mould colony on it or not, the soda will be unchanged (except for gas that has come out of solution). 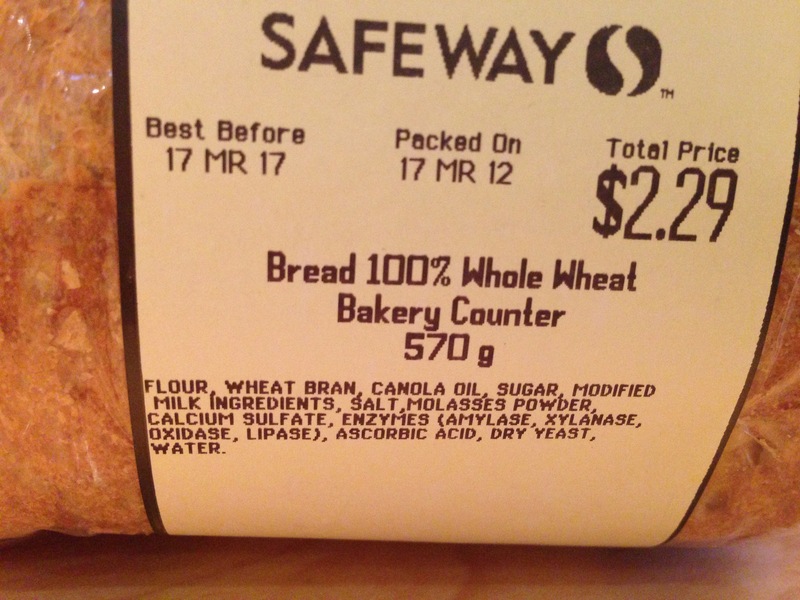 After a week for the breads, the bread with the shorter expiry dates will be starting to grow mould, especially if sprayed with water. Students can count the number of mould colonies. 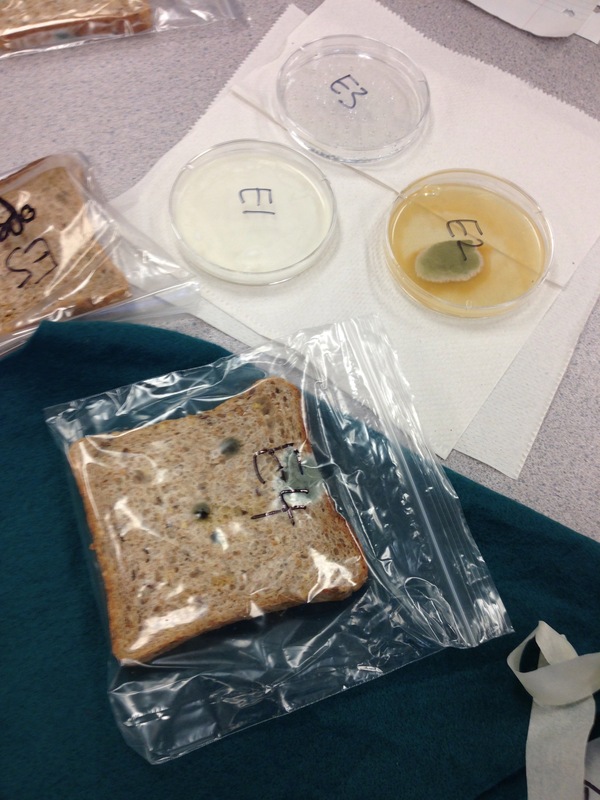 Make sure the students look for small colonies and under the bread too. The bread with a 10 day expiry date will be unchanged. If there has been a lot of mould growth, likely because of higher classroom temperatures, maybe move to discussion of results and mould observation. 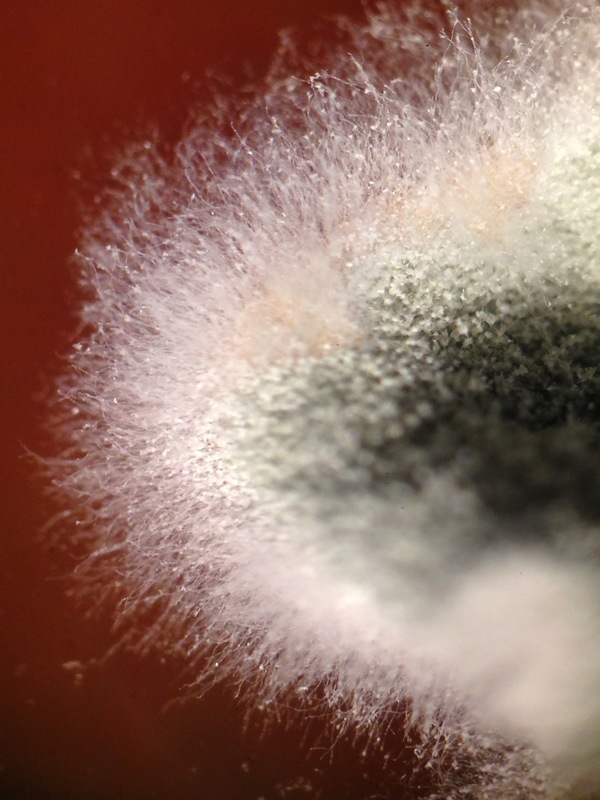 If the mould colonies are small (1cm diameter or less), an additional week of growth is recommended to grow more impressive colours and colony sizes. After final documentation of changes observed, discuss the class results in terms of conditions that living things that promote decomposition thrive in. A consolidated table of class results can help with discussion, though it can be complex with the many possible variables. If results across groups are compared, be sure to compare results with only one variable changed between them. The soda likely did not encourage any mould growth. Read out the soda ingredients, and point out that it does not contain many nutrients (apart from sugar) that mould needs for growth. Fresh apple juice likely had some mould growth, and the ingredients of apple pulp contain many nutrients as well as sugar, that mould needs for growth. Boxed apple juice that is sold at room temperature may yield different results. Milk was clumped and stinky very fast. Discuss the microorganisms present in milk (mostly harmless bacteria) and that at room temperature, they have grown and multiplied. Specifically, the harmless bacteria Lactobacillus is present in milk (it is not destroyed by pasteurization), and as it grows it releases (lactic) acid. Acid interacts with milk proteins to make them clump. (Some harmful bacterial spores also survive pasteurization, which is why milk should be kept in the fridge, and should not be consumed if the milk is spoiled.) rapidly spoiled from bacterial growth, but given time, mould would likely have grown in the milk too. Milk provides a host of nutrients for growth of bacteria and mould. Breads: The breads will be variable in how much mould grows on them, depending on the conditions. Shelf life: Bread with a longer shelf life will generally have less mould growing on it. 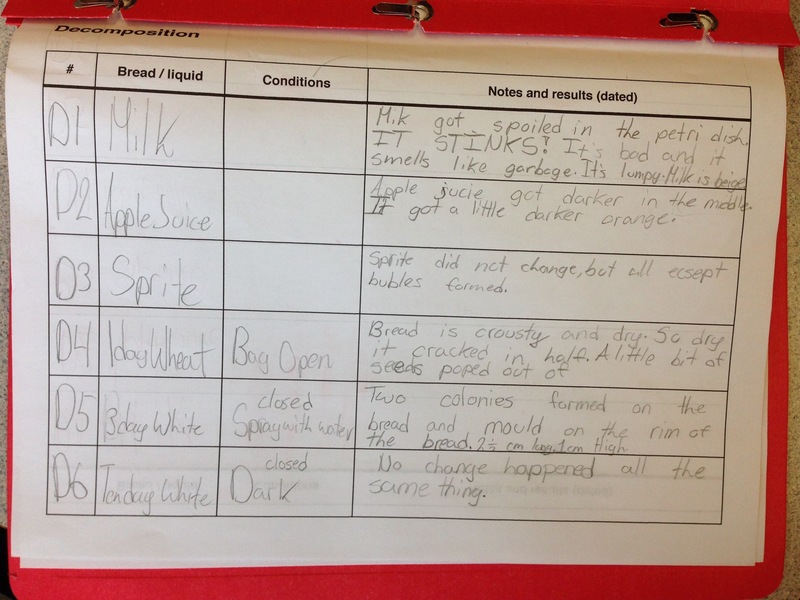 Read out the ingredients to challenge students to figure out why it may stay fresh longer. 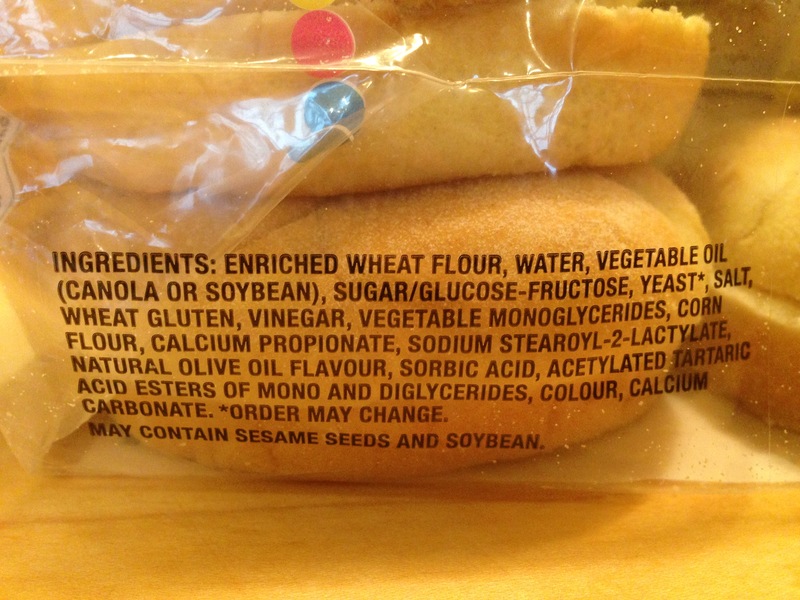 Preservatives such as calcium propionate and sorbic acid, are added to long shelf-life breads. They inhibit mould and bacterial growth. Moisture level: Bread out of a bag turns dry very quickly and does not allow any mould growth. Bread enclosed in a bag grows mould as the bread contains some moisture. Bread that is misted with water before putting in a bag will grow a lot of mould. Conclude that mould grows better in a moist environment. Light level: Some moulds grow better in the dark vs the light, though this is not universal. Temperature: Mould would be expected to grow faster in warmer conditions. This is why we put food in the fridge to slow down deomposition and the spoiling of foods. Moulds generally grow faster in the dark vs in bright light. (Our breads did not show a strong difference between bread in the light and wrapped in dark cloth, maybe because all the samples were stored on a high shelf which was not well lit). Transfer a piece of the mouldy bread to a petri dish to look under the microscope, or place the apple juice dish under the microscope to look at its mould. 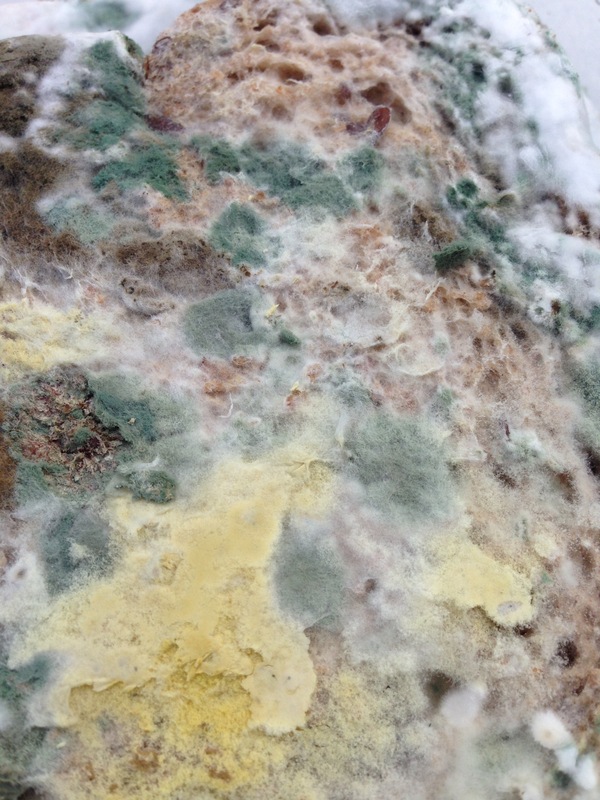 Mould reproduces like every living thing. Long wispy hyphae spread out from where a mould spore landed. The hyphae grow over and through the bread/drink. Some hyphae grow upwards, and form spore heads at the top. As the spores at the centre of the mould colony ripen they darken, and the dark colour spreads outwards as more spore heads are formed. Different moulds have characteristic colours because of their spore colours. Rhizopus (black bread mould) has black spores, Neurospora (red bread mould) has red-brown spores, Penicillium has blue green spores in the centre of the colony with a white ring surrounding the colony. Students should be able to see the long wispy hyphae of the mould around the edge of a colony using 10X or 20X power (see photo of mould on apple juice). With higher power the vertical hyphae with tufty spore heads may be visible, though individual spores are too small to see (see photo on bread; compare to web image: http://2.bp.blogspot.com/-m6wEVx0nI4g/ULobDEplvAI/AAAAAAAAIKc/Tju6woNRns...(1024X768).jpg). 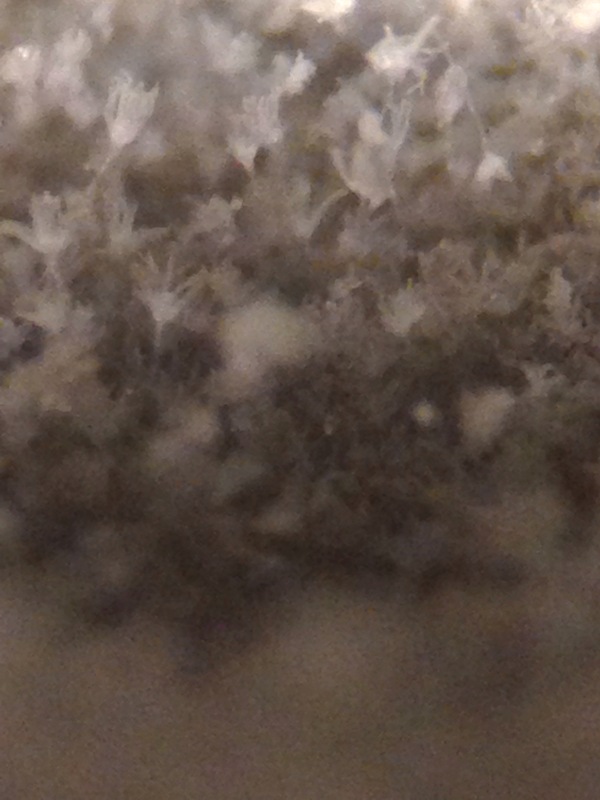 Watch a video of mould growth in slow motion, to show the hyphae growth, followed by spore formation and darkening. https://www.youtube.com/watch?v=JsQHWj2RfXg is a beautiful video.